CROCKETT – In horse racing terms, Robert Francis “Beto” O’Rourke started out his U.S. Senate campaign as a longshot. Slowly, through his grassroots efforts, O’Rourke became a dark horse. Now, as the senate race heads into the homestretch, the El Paso congressman is charging hard on the outside and is neck-and-neck with incumbent U.S. Senator Ted Cruz. With just over a month left before the November election, both candidates and their families are on the campaign trail, hoping to sway those voters who are still undecided. 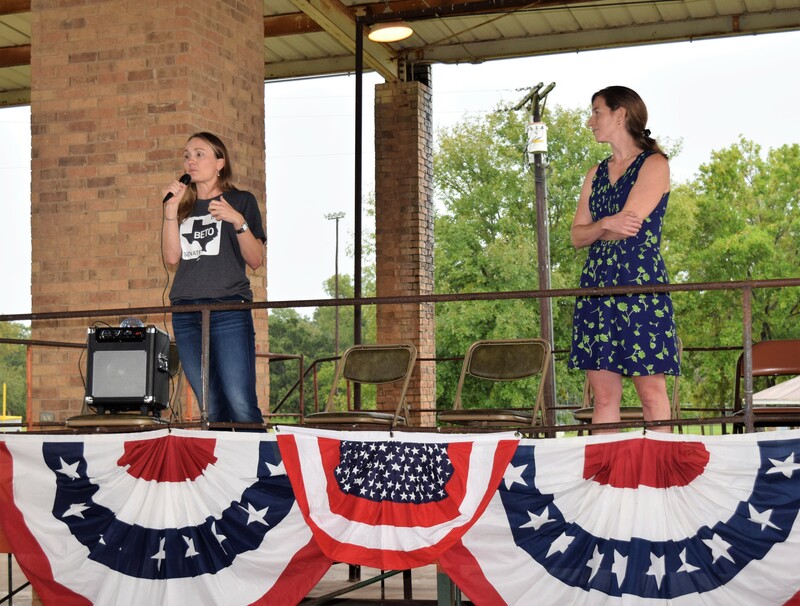 On Monday, Oct. 1, the O’Rourke campaign made a stop in Crockett as the congressman’s wife and sister held a rally in Davy Crockett Park. Despite the dreary, rain-soaked day, a few dozen people showed up at the Pavilion to hear what the O’Rourke’s had to say. The candidate himself was in the Central Texas area on Monday. 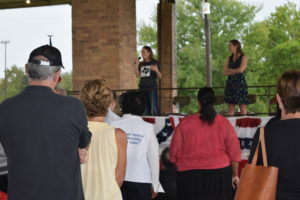 The rally was opened by Houston County Democratic Chair Sharon Berry who introduced O’Rourke’s wife, Amy, and his sister, Charlotte. “These ladies represent a gentleman who is not only capable and qualified, but is willing to fight the fight – across the boards – for Texas,” Berry said. His sister spoke first and in true sibling rivalry fashion, she joked he was her older brother by almost five years while she described the O’Rourke family as they were growing up. “Beto is absolutely amazing,” his sister said. “The man you see each and every day whether it’s on Facebook, in an article or hear him on the radio or TV, it is truly who Beto is,” she said. As it turned out, his sister said, he won the race for council and after seven years on the city council, he turned his attention to the national level. Employing the same approach, O’Rourke went door-to-door to find out what the constituents of the 16th Congressional District were concerned about. The strategy worked and O’Rourke defeated eight term incumbent Silvestre Reyes in the Democratic primary. When Charlotte O’Rourke finished speaking, the congressman’s wife Amy O’Rourke, took over. 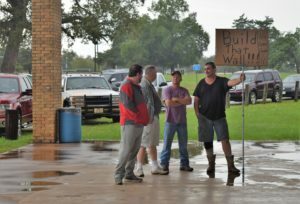 In an act of inclusion, O’Rourke invited several protesters standing at the back of the pavilion to come join in with the others in attendance. The protesters declined to do so and Amy O’Rourke began her stump speech saying she wasn’t sure if she could add anything to what her sister-in-law had just said. Following her address, the O’Rourke’s opened up the floor for questions.